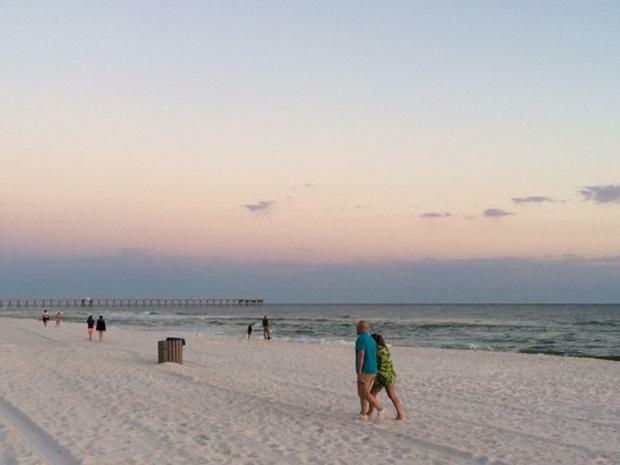 Panama City Beach condo: 2 bed / 2 bath condo unit at the best location! 2 bed / 2 bath condo unit at the best location! 1 / 12 Beach is just steps away from the door. This 2 bed room, 2 bath room condo unit has the best location for your vacation. The emerald water and sugar sand beach is almost right on your foot-heel, while the public beach access #44 and #45 is just about 100 feet away on both sides. The Half Hitch - MB Miller Pier is just half mile away, a good place for fishing and walking. The Pier Park Shopping Mall is less 3 miles away, where you can go for shopping and dining. Plus many bars and restaurants are clustered nearby. It is also very easy to access to the middle beach road and highway 98 so you can avoid bad traffic on the front beach road during the hot season. As the facility goes, this is a newer condo; it is very clean and well equipped. It has a brand new AC unit to ensure your comfortability. New TV on each bedroom. The parking space is under the cool shade of the building. You have a wonderful ocean view from the balcony, the living room, and the master bed room, you can watch the beautiful sunset right on the balcony. This was a very quaint, clean and comfortable condo for my family of four. It's very reasonably priced and the owners are very nice. There are televisions in each bedroom and the living room. The internet speed is very acceptable. We watched streaming movies ( from a device we brought from home) with no issues. Cable TV is provided but, frankly, we stayed out most of the time and didn't watch much television. It has a nice kitchen with most of the supplies you'll need to cook your meals. The beach is just across the street. The street gets busy during the evening hours but isn't bad at all during the day. I loved the private parking and the air conditioning was great. I'd definitely stay there again.